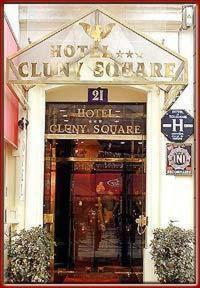 Cluny Square, Paris discount hotels and accommodation. Entirely air conditionned, the Cluny Square is ideally located on the Left Bank, where the Boulevards Saint Michel and Saint Germain meet, in front of the Cluny Abbey, right at the heart of Paris's cultural heritage : the Latin Quarter. It is very near from Notre Dame de Paris, the banks of the Seine and the Louvre and Orsay museums. It's an ideal location for tourism and holidays in the capital. Guests can enjoy our warm welcome and service 24/7. View photos, room descriptions and make online reservations at Cluny Square. Save on room prices at Cluny Square, Paris.